I got some news this weekend that came as somewhat of a surprise to me. 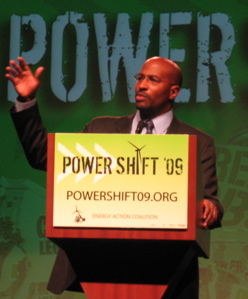 In fact I woke up to multiple texts early Sunday morning from friends notifying me that Van Jones, the special advisor for green jobs to our nation’s administration, had just stepped down from his position. During the past year and a half, I have worked with the organization Green for All to help push for good, green jobs in our state of New Mexico. Throughout this time I was able to meet Van a few times, and I even had the honor of introducing him in front of thousands of people on the opening night of the 2009 Powershift conference.